At 14% it’s the strongest RTD on market – it isn’t watered down! Made with award-winning Fabrizia Limoncello and REAL lemonade. Fabrizia Spirits discarded over 100,000 peeled lemons (rinds of which were used to make Fabrizia Limoncello) in 2014 alone. By creating lemonade with those lemons, it created a fresh, all-natural base for its newest product, the Italian Margarita. About 60% of the product is real lemonade made from fresh lemons, cane sugar and includes no preservatives. 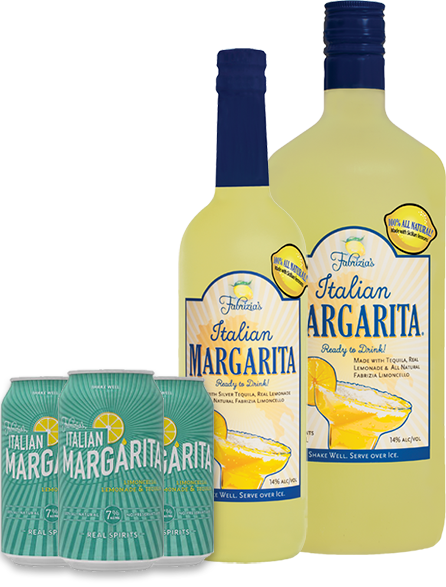 The Italian Margarita contains NO artificial colors, flavor additives or preservatives! All other major RTD products include either yellow number five or artificial flavors. Like the rest of its products, Fabrizia produces high quality items for competitive prices, especially for small batch, handmade and of course, all natural. Recommended retail $9.99-$11.99 for 750ML.